Put your audience at the heart of your digital marketing with Predictive’s applications, all of which have been built on the Salesforce® platform. Effortlessly keep them engaged by continually listening to and capturing every interaction with your brand. Use a contact’s own interests and behaviors to your advantage; create compelling, customized campaigns to get the most out of your email marketing. No software to install; works directly inside of Salesforce. Automate and simplify the process of adding leads and contacts directly into a campaign. Use a template or build your own. No HTML knowledge needed. With our easy-to-use, impactful features you can develop, deploy, and manage professional, engaging, multi-step email campaigns. Install in a snap thanks to native Salesforce ® integration. Forget worrying about logging in someplace else, everything is managed right in your Salesforce ® deployment. Just grant access to your users and they’re off to the races. Install the latest Predictive Marketing Automation solution and get cutting edge marketing capabilities in your new Lighting user interface. It is an amazingly efficient, intelligent user experience enabling nonprofit marketers to work faster and smarter, while delivering better results and driving user adoption. 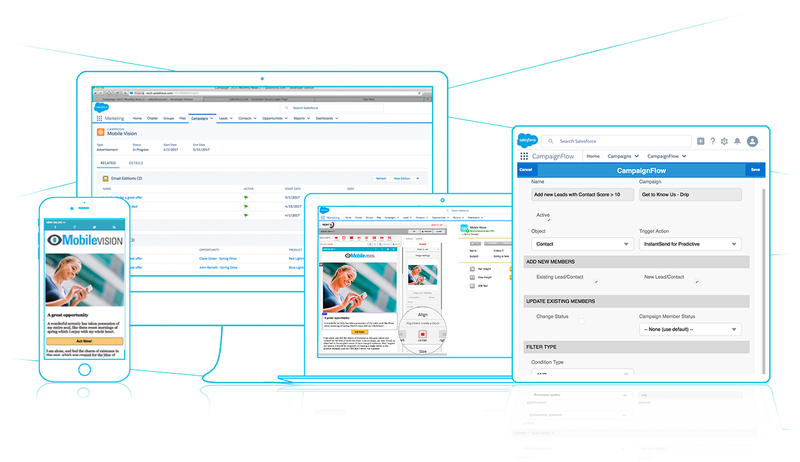 Real-time reporting gives you all your email metrics (opens, clicks, click through URLs, opt outs and campaign completions) where you want them — inside Salesforce®. Drip campaigns send emails at the cadence you choose and are especially effective for nurturing new leads. Adaptive emails adjust to a recipient’s behavior so you can respond to their actions as they open, click and complete a campaign. Prospect tracking and lead scoring identifies which contacts and prospects are most engaged with your email and website. Don’t just take our word for it…read some of the feedback we’ve received from Predictive users. “I switched from Constant Contact to Predictive Response and could not be happier. Predictive Response has given me insight into my marketing campaigns that was previously unavailable. Without a doubt, Predictive Response has already paid for itself due to increased revenue and prospecting capabilities.” – John D.
I have worked with Salesforce through my nonprofit for a few years and have worked with a few app providers to customize our platform. I have to say that the team at Predictive Response is amazing and their support services go above and beyond. I would recommend them to anyone based on their support! We’ve tried many others and this one is by far the best. Includes the means to setup templates with an editor that is truly easy to use. The flexibility of the email system is fantastic. PR has streamlined our marketing and is one of the best investments we’ve ever made in this area. Try it, you’ll love it! Predictive’s software offers excellent value with very easy-to-use yet advanced features, effortless integration with Salesforce, and an outstanding support team. All this is delivered at competitive price points. You can view all of our user reviews & testimonials here!